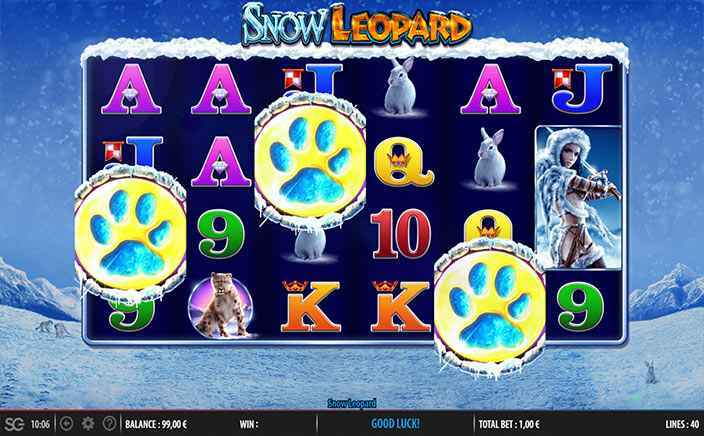 Snow Leopard is a fantasy slot where a clad girl can be seen roaming among the chilly wastes in the company of various wild animals. The top attraction is that it is loaded with free spins as well as features the famous Big Bet option. 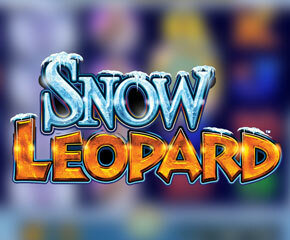 Snow Leopard slots is featured on an icy landscape where the snow can be seen continuously falling from the blue sky. It is a slot with 6 reels, 4 rows, and 40 paylines. The high-value symbols include the animals like the brown leopard, the rabbit, and the squirrel and the low-value symbols include the playing card numbers 9, 10, Jack, Queen, King, and Ace. The wild symbol is the snow leopard that can replace all the symbols except the scatter i.e. paw print symbol. The slot offers its players the Free Spins feature which gets triggered when you get three or more scatters i.e. paw print symbols anywhere in the reel. You get 8 free spins on landing 3 scatters, 20 free spins getting 4 scatters, 50 free spins for 5 and 100 free spins if you land up with 6 scatter symbols, however, this is available only during the Big Bet option. The players get more free spins if they land up with more scatters during this feature. And then there comes the Big Bet option for the players who want to bet a little extra on their stake. Here you get to buy some extra features to play with five linked spins on both the sets of reels placed adjacently. Then, the players need to select from three modes to play i.e. ‘Independent reels’ where the reels will not be connected, ‘Matching Wilds’ where the wild reels will be at the same place in both the reels or ‘Matching Spins and Wild reels’ where the reels will get synchronised on both the reels. Further, as per the Big Bet option, you select, there will be additional features too. £20 option will give you no extra feature, £30 option will give you 2x multiplier wilds, £40 option will give 2x/ 3x multiplier wilds and £50 option will give 2x/ 3x/ 4x/ 5x wild multiplier along with the low-value symbols 9, 10 and J removed from the reels. Snow Leopard slots having an RTP of 97.75% makes it a must-play game and enjoy the free spins features and not to mention the Big Bet Option that can take your winnings to another level.